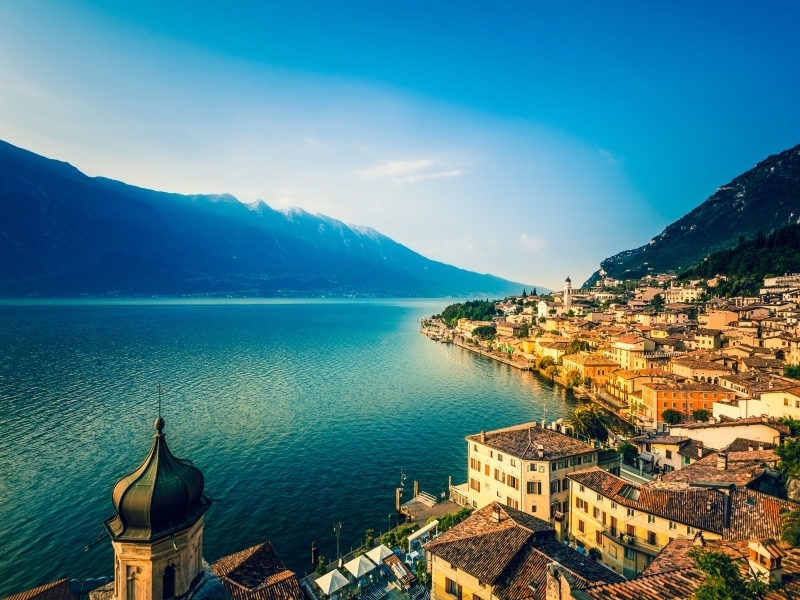 Discover the many sides of Lake Garda, on a holiday to Italy. Italian holidays can promise romance, glamour and scene-stealing, film-set prettiness; and Lake Garda has them all. Add to that a Mediterranean-like climate, a location surrounded by alpine mountains, plus fine foods and wines, and you’ll soon realise that Italy’s largest lake is one of those places in the world you just have to visit… probably more than once. It’s clear blue waters are fringed by colourful flora and backed by the wooded slopes of craggy mountains, and it’s this jaw-dropping natural beauty that has been drawing visitors (including the rich and famous) to its sun-kissed shores for over 100 years. Flights also available from airports in England – Bournemouth, Bristol, Cardiff, East Midlands, Cornwall Newquay, Durham Tees Valley, Humberside, Gatwick, Luton, Stansted, Manchester & Norwich – click here for more information on dates & prices. Fly to Italy, meet our Tour Manager and transfer to your hotel on Lake Garda. Enjoy a relaxing day at your hotel, or start exploring Lake Garda and the surrounding area. Our Tour Manager will be happy to suggest places to visit and things to do. Our optional Grand Circular Tour will reveal the marvellous scenery that surrounds Lake Garda today, by coach and boat. Explore some of the charming lakeside resorts and discover the distinctive character of each section of the shoreline. Iconic Venice, a mysterious labyrinth of waterways and alleyways, is one of the world’s most beautiful cities. Join our fascinating optional excursion to discover legendary places – the Bridge of Sighs, the Rialto Bridge and the Doge’s Palace, famous St Mark’s Square and Cathedral, the bell tower and the Palace of Prisons. Spend a relaxing day enjoying Lake Garda, your hotel and the surrounding area, today. On today’s three-quarter-day optional excursion we’ll explore “fair Verona”, the historic setting for the tragedy of “Juliet and her Romeo”. See the Roman amphitheatre, where the city’s famous opera season is held each year, and treat yourself to a coffee-stop and some people-watching at one of the open air cafes in the Piazza Bra. The Dolomites, one of Europe’s most spectacular mountain ranges, are our destination on today’s optional sightseeing tour. On this full-day excursion we’ll visit Val Rendena, see the vast Adamello Glacier, the neighbouring Brenta Dolomites and pretty Val di Genova. Don’t miss the chance to soak up the views on an optional cable-car ride. Bid “Arrivederci Italia”, as you return to the airport and check in for your flight home.